Best wishes to Anton McCabe in his campaign to become a member of the Navan Town Council on behalf of the Labour Party. 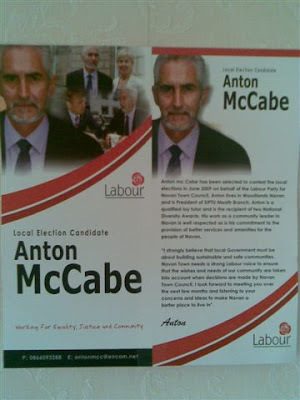 Anton McCabe has been selected to contest the local elections in June 2009 on behalf of the Labour Party for Navan Town Council. Anton lives in Woodlands Navan and is President of SIPTU Meath Branch. Anton is a qualified lay tutor and is the recipient of two National Diversity Awards. His work as a community leader in Navan is well respected as is his commitment to the provision of better services and amenities for the people of Navan.
" I strongly believe that local Government must be about building sustainable and safe communities. Navan Town needs a strong Labour voice to ensure that the wishes and needs of our community are taken into account when decisions are made by NavanTown Council. I look forward to meeting you over the next few months and listening to your concerns and ideas to make Navan a better place to live in ".